Rail Systems - Airsan Corp.
For decades, Airsan has provided air filtration solutions for commercial transportation systems including the rail industry. Airsan's high-quality air filters and filter accessories are made in the USA and engineered to optimize the efficiency and cost-effectiveness of rail system operations. For diesel engines, contaminants and particulates in the air can lead to severe damage of engine components. Poor intake air quality can reduce engine performance, create higher fuel consumption and increase exhaust emissions. 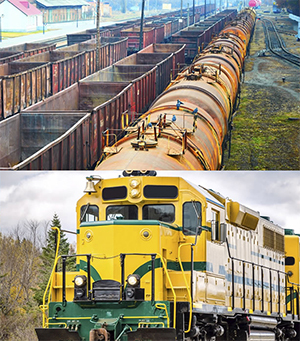 Airsan Type PP medium-duty filters are specifically designed for engines, compressors and other applications with higher particulate filtration needs, such as railway locomotives. When used as pre-filter components, Airsan filters can minimize pressure drop, eliminate moisture, and improve overall function and efficiency of locomotive engines.